Tomorrow is an important day for the small businesses that count on your support during the holiday season. What I enjoy about shopping local is the unique gifts that you can purchase for that special person in your life. There is nothing like receiving a gift that is handcrafted by a local person or a gift certificate to your favorite local store. Think about all the wonderful places we have to pick from when selecting that special gift. We are fortunate to live in a community that is alive with tradition. Forget the mall - shop small! Enjoy the weekend. Happy Shopping! 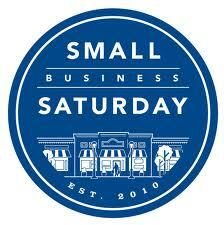 Click here for more information about Shop Small Saturday.